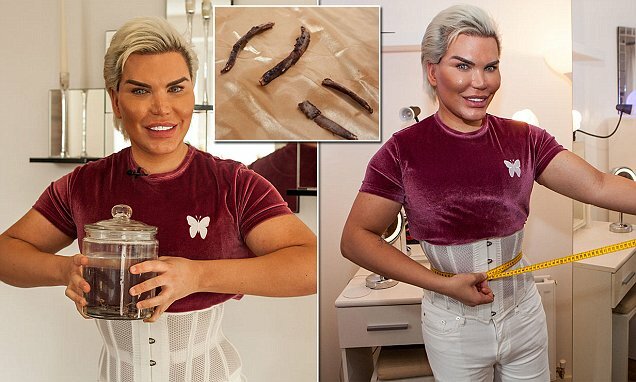 Human Ken Doll Rodrigo Alves has lost five inches off his waistline thanks to his controversial rib removal procedure and he is hoping to shrink to a tiny 20-inch waist if he keeps wearing corsets. The 34-year-old plastic surgery addict claims he had the $28,000 procedure not to match any conventional standards of beauty but so that he can look even more unique. Rodrigo told Barcroft TV, 'Having my ribs removed is not important. What's important to me is to look a certain way. I like to look different. 'I like the fact that I have reinvented myself with the help of plastic surgery and that I don't look like any other man, I don't look like anyone else and I do like that. 'I am my own person, I am my own brand and it feels good to be an individual as well. Having the ribs removed is just a small fraction of it. Thanks to his rib removal surgery where he had four floating ribs removed, Rodrigo has dropped from a 34 inch waist to 29 inches. Rodrigo finally has the coveted silhouette he's wanted for so long but admits he needs to wear a corset 24 hours a day to maintain his hour glass curves. He said, 'I'm very pleased with the results of the surgery and now I can wear my blazers and they fit beautifully and my waist does look smaller.